Read below to learn about the reasons of a mango tree not flowering and fruiting and the methods and sprays to force a mango tree to induce fruits on a not-fruiting mango tree. I have two mango trees, 5 years and 10 years old. Both produce fruits regularly every year. However, the number of fruits vary every year, sometimes more and sometimes only a few. I have noticed that the branches that had produced fruit one year will rest in the next season, while other branches of the tree will bear fruit. This way, the trees are producing fruits every year. There are many reasons for the mango tree not producing fruit, the fruit set in mango tree depends on several factors. These include weather conditions, mango diseases, watering, pruning, wrong fertilization, etc. BUT note that too many favorable conditions will prevent the mango tree to fruit. Check the location and light exposure to your mango tree if it is not fruiting. The mango tree must have favorable conditions for its healthy growth to bear fruit. Plant your mango tree in a location which receives 6 hours of direct sun otherwise, it will not fruit. Also the area should be protected from wind and extreme cold temperatures. If neighboring tree are shadowing the mango tree, then you have to prune down those trees so that the mango tree can receive the light. Temperatures below 4.5 °C (40 °F) can damage a mango tree blossoms. PProtect your mango tree with blankets if the tree is small. You can use heat lamps or Christmas lights to protecy the trees from low temperatures. Do not give much water to a mango tree over four years age, except an occasional deep-drink during extremely hot and dry weather. Over-watering can limit fruit production and its quality. Too much rains can cause fruits to drop prematurely, seriously affecting harvest. Too much water in winter may affect the formation of blooms. Two major fungus diseases on mango trees, namely powdery mildew and anthracnose are responsible for non fruiting mango trees. These diseases occur when mango foliage remains wet for long periods of time. The anthracnose causes black leaf spots (video on how to manage black spot disease on mango tree), bloom blight and fruit rot, affecting potential fruit set and production or only a few fruits with black spots. These diseases will destroy the panicles hence the mango tree will not produce fruit. To control these diseases spray whole parts of the tree with sulfer or copper fungicide solution, specially when blooms start to form until fruits are ready to be picked up. The infection by pests on mango tree can be controlled by regular neem spray. One of the important factors for the non fruiting of mango tree is over fertilization or wrong fertilization. Nitrogen fertilizer will result in foliage growth only. If the mango tree is planted in the lawn, then the lawn fertilizer (which is high in nitrogen) will affect the fruiting in the mango tree because its roots spread far beyond the drip line of the tree and feed on nitrogen in the soil. Add some bone meal to the soil around your mango tree to negate the effect of too much fertilizer. Feed with a fertilizer high in potassium, suitable for citrus trees. 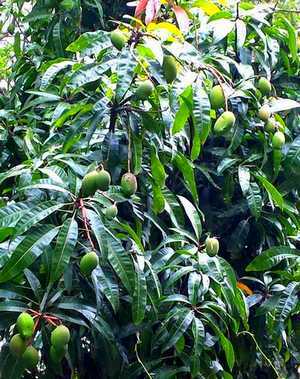 Over fertilizing a mango tree prevents the tree from fruiting. Severe pruning may reduce fruit production from one to several cycles. Therefore, prune only the broken, diseased or dead stems. Pruning a mango tree can stimulate vegetative growth in favor of fruit. In addition, pruning done at the incorrect times may remove tips that produce blossoms. A mango tree can be pruned safely immediately after fruiting but not before fruiting. The last reason for your mango tree not producing fruit may be the age, if the tree is too young or too old. Several techniques can help induce the flowers you need to ensure an ample mango harvest. You can try the following methods to force a mango tree to fruit. pruning half the blooms if the tree blooms. Drought stress when the plant produces blossoms is desirable. Success has been achieved in stimulating mango flowering on non-fruiting mango trees with chemical treatments. Note that forcing of mango fruits or blooms by chemical method is only for healthy mango trees at least 10 years old. Spray a chemical solution of 2 percent potassium nitrate (20 g in 1 liter water) on the mango tree early in the flowering season to force flowering and fruiting . Spray thoroughly both sides of leaves, branches and trunk. Adding 1 g urea in the nitrate solution may yield better mango yield . Spray a second time after 15-20 days if the response to the first spary shows no results. Application should be made prior to emergence of the flowers, never spray the tree while it is flowering because the nitrate can damage mango blossoms. Calcium nitrate (2-3 %) can be sprayed instead of potassium nitrate to get good results . Application of paclobutrazol (6g/tree) in soil and foliar spray of potassium nitrate 8 weeks after paclobutrazol treatment can result in a significant increase in flowering and and foliar spray of potassium nitrate 8 weeks after paclobutrazol treatment very early flowering . Cut the concentration of nitrate in half in sunny weather or on mature trees that already have dormant buds. Spray the mango tree on a cloudy day, early in the day. Avoid days when rain is expected. Adding compost in the soil and as mulch helps the soil retain nutrient. This improves the mango yield by up to 24 % . 1. Barba, RC., Induction of flowering of mango by chemical spray, Crop Sci. Soc. Philippines Proc.5:154-160 1974.